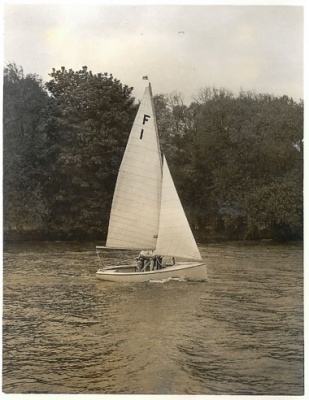 During 1938 sailors connected to Oxford and Cambridge Universities asked Uffa Fox to design a dinghy similar to the National 12, but one design and more suitable for team racing. Uffa completed this design in 1939 and called it the Sea Swallow. Then came the war and nothing happened. During this time Colin Chichester-Smith, who was a director of the Fairey Aviation Company, often thought about a production dinghy based on the principles used for the manufacture of wooden Mosquito aircraft fuselages, which were formed on a mould and cured by electrically heated bands holding the laminate in position. Early in 1946 Uffa Fox was asked by Chichester-Smith, in conjunction with Stewart Morris, to design a one-design twelve foot dinghy. About this time Charles Curry joined Fairey to develop the marine section at Hamble. It was easy for Uffa to design such a dinghy; he just scratched out the name ‘Sea Swallow’ and replaced it with ‘Firefly’, so named after the famous Fairy aircraft. 1946 – F1 takes to the water for the very first time. click to enlarge images. The initial boats were 1/16″ birch plywood and, through aircraft connections, Tony Reynolds was asked to produce a metal mast with spruce for a wooden top. The initial cost of a boat was just £65, and the first four were bought by Sir Geoffrey Loules, Commodore of Itchenor Sailing Club, and Christened Fe, Fi, Fo and Fum. There were a few tweaks after the initial batch of boats were produced, which lead to the boat being selected for the single handed class at the 1948 Olympics to be held at Torbay. After a very windy week the boat proved a handful for just one, and was replaced in 1952 by the heavier, more expensive Finn class. However the class grew rapidly as a two person class, winning favour with schools, universities, the forces and many team racers. None of the early development and success would have been possible without the backing of Sir Richard Fairey, Chairman of the Fairey Aviation Company, who had a lifelong interest in sailing and was a distinguished helmsman. The points cup for the overall National Champion bears his name. The Y.R.A. as it was then, gave its full support to the class, and Sir Ralph Gore, chairman at the time, presented the trophy for the Individual Championship Race. In 1959 Terylene sails were introduced, as cotton sails were virtually out of production. These gave the boat a slight increase in speed, but were more durable and required less attention to avoid deterioration in performance. An interesting quirk of the early days was the production of around 100 boats with aluminium decks. This was caused by the unavailability of 6mm marine grade ply!! By 1965 the Firefly looked dated compared to the new classes that were springing up. Consequently the need was felt for a revised deck layout, named the MkII. The side decks were reduced to 4″ and the foredeck camber was increased, removing the need for a spray deflector. Performance was unchanged. Another important change introduced in 1967 was the introduction of a light alloy centre plate to replace the galvanised iron plate. This did effect speed, making the boat slightly faster down wind, but also much easier to handle out of the water. A further important change was made in 1968, the introduction of G.R.P. construction. Although wooden Fireflies had only required minimal maintenance, it was felt any further reduction would benefit the institutions. The Fireflys were responsible for one or two other historic innovations. The gate start invented by Bee McKinnon, a master at Eton College, was first used during the Firefly Championship Week at Torquay in 1955. This was a highly operation, and is used toady throughout the world. To further improve the one design characteristics, and reduce costs, the class moved to sails made from Ratsey and Lapthorne’s Vectis sailcloth. These changes were made in 1970, and at the same time the Reynolds mast was replaced by a one piece rotating mast from Proctors. Following negotiations the end of 1972, Vic Lewis Boats were appointed as sole builder from January 1st 1973, thus ending the Firefly’s long association with Fairey Marine. Vic Lewis worked with Craft Mouldings and the class to produce a new G.R.P. mould. A boat available with either G.R.P or wooden decks was introduced in 1976. In 1975 with inflation rampant, the cost of producing a rotating mast specifically for the Firefly became prohibitive. It was decided to adopt a fixed mast of standard design that could be purchased anywhere in the country. In 1976 Knight and Pink Marine started producing wooden boats again, the first since Fairy stopped production in 1973. The new boats were cold moulded, and the side decks changed in design, but not width, to be named the MkIII. In 1982 three changes were made. Dissatisfied with the consistency of Ratsey’s sails, and the quality of the boats produced by Craft Mouldings. Hyde Sails were appointed as sailmakers, and the class association bought the Firefly moulds from Craft Mouldings. This proved to be essential in the longevity of the class. They were given on loan to Omega Boats to produce a foam sandwich GRP boat. Finally in 1982, a deep rudder was allowed in place of the swept back design, to give more stability down wind in waves. Porter took over production of the G.R.P. boat up until 1995. It was decided that the boat needed an overhaul. The cost for Porters to do this would have driven the boat away from its low cost principle, so it was decided to work with another builder. After development with Hyde sails windows were allowed in sails for the first time in 1997, increasing visibility and hence safety whilst sailing up wind. At the Firefly’s 50th anniversary National Championship the first plug from Rondar Raceboats was seen. In 1997 they took over production of the boats. As with all good one design’s, subtle evolutionary changes are made to keep the boats relevant, and this was no exception. Buoyancy was increased and the mast height was increased very slightly in 1997. This negated two of the Firefly’s bad points in one go, allowing novice sailors to sail without worry of sinking, and larger crews to sail the boats comfortably. A slightly more contentious issue was to replace the slot in the boats alloy centre plate, with a hole. This was to prevent the plate falling out of the bottom of the boat when upside down. This was passed by the class association in 1998. Since these changes the Firefly has seen a great revival, becoming the boat of choice for team racers across the land. Click on link below for more …..